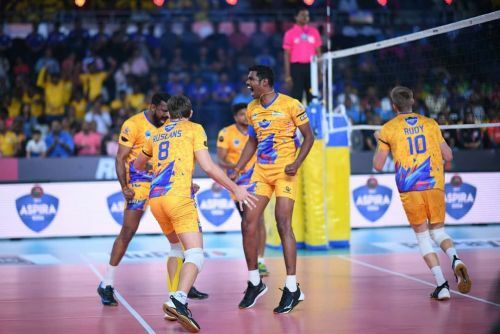 The Chennai Spartans will be aiming to cap off their league stage encounters with a victory when they square off against Ahmedabad Defenders in the fourteenth match of the RuPay Pro Volleyball League 2019 at the Jawaharlal Nehru Indoor Stadium in Chennai. The Spartans failed to start strong at home against the U Mumba Volley in their previous assignment and will need to pull up their socks and hit the straps early on in the game. On the other side of the court, the Ahmedabad Defenders have had nothing going their way as they have failed to register a single win in three matches. Two wins in their final two games could give them a spot in the semifinals. However, a loss to the Spartans is certain to close the door on their qualification hopes. The Spartans did not have the greatest of starts to the season with a 4-1 loss at the hands of the Calicut Heroes but came back strong to register a dominating 4-1 win against the Black Hawks Hyderabad. Against the Kochi Blue Spikers, the Spartans had the upper hand with a 2-0 set advantage but wasted the start as they failed to hold on to the lead and lost three sets in a row to hand the Blue Spikers a memorable 3-2 victory. In their previous matchup against U Mumba Volley, the Spartans' first match at home, the home team succumbed to the visitors in the first three sets of the match but came back strong to clinch the final two sets and will be looking to continue their momentum into the game against the Defenders. Ranjit Singh's Ahmedabad Defenders, on the other hand, had to face losses in all their matches, thus denting their chances of qualification into the knockouts. However, what has been the major issue is the fact that the Defenders failed to bring their best to the fore in their first two matches and given a chance to take the win at 2-2, Ranjit Singh's men could not find their winning strategy. Against the Spartans, the Defenders will have to conjure up a winning algorithm, a formula that would give them an important win and more importantly keep them in the hunt for the qualification. For the Spartans, the equation is pretty simple. A big win heightens their qualification while a loss will send them tumbling out of the competition. Ahmedabad Defenders - Ranjit Singh (c), Victor Sysoev, Mandeep Singh, GR Vaishnav, Novica Bjelica, Gurinder Singh.